You have two days to take advantage of JetBlue Airways' Fly-It-While-Its-Hot Sale with discounted fares through summer. Hold on and grab a deal on peak travel to your favorite destinations. No, they don't fly to Hawaii. Yet. If California, the East Coast, or Florida are in your summer sights, this is a good time to book some travel. Travel is from June 4 - August 28. By the way, these prices include government taxes and fees! 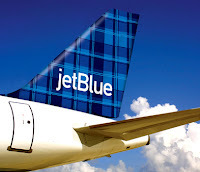 Click here to view the full list of fare deals and to book with JetBlue Airways.